In keeping with the "KISS Principle", this is an attempt to offer the MVC design pattern to Flutter in an intrinsic fashion incorporating much of the Flutter framework itself. All in a standalone Flutter Package. Usage Let’s demonstrate its usage with the ol’ ‘Counter app’ created every time you start a new Flutter project. In the example below, to utilize the package, three things are changed in the Counter app. 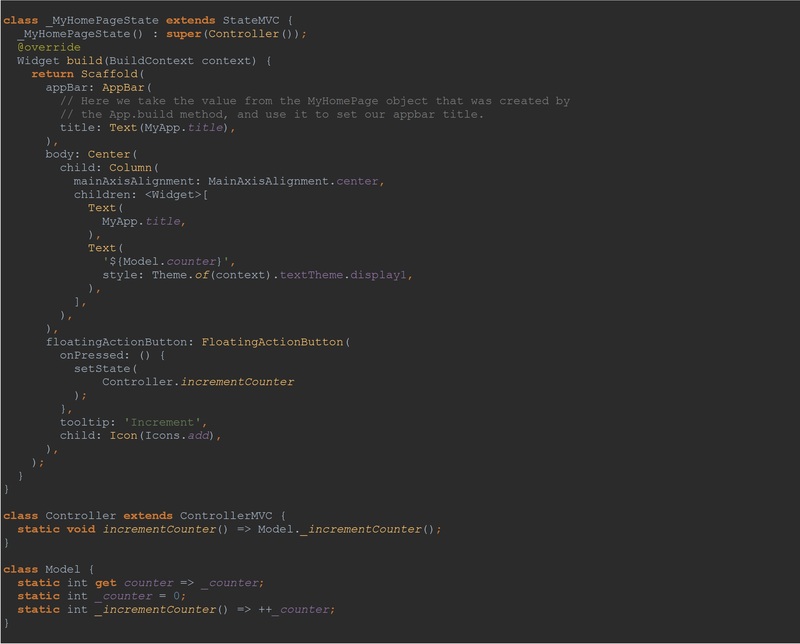 The Class, _MyHomePageState, is extended with the Class StateMVC, a ‘Controller’ Class is introduced. It extends the Class, ControllerMVC, and a static instance of that Class is made available to the build() function. Done! (Note, you will find the 'source code' for this example in this package's test folder. With that, there's now a separation of ‘the Interface’ and ‘the data’ as intended with the MVC architecture. 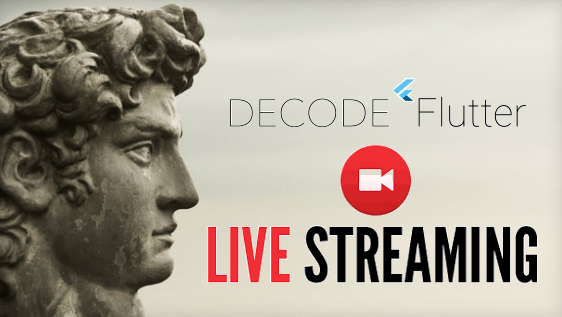 The build() function serves as 'the View.' It's concerned solely with the ‘look and feel’ of the app’s interface—‘how’ things are displayed. While it is the Controller that determines 'what’ is displayed. The Controller is also concerned with 'how' the app interacts with the user, and so it's involved in the app's event handling. What data does the View display? It doesn’t know nor does it care! It ‘talks to’ the Controller instead. Again, it is the Controller that determines ‘what’ data the View displays. In this example, it’s a title and a counter. And when a button is pressed, the View again ‘talks to’ the Controller to address the event (i.e. calls one of the Controller’s public functions, incrementCounter()). In this arrangement, the Controller is ‘talking back’ to the View by calling the View’s function, setState(), telling it to rebuild the widget tree. Maybe we don’t want that. Maybe we want the View to be solely concern with the interface and solely determine when to rebuild the widget tree or not. It’s a simple change. The View knows how to 'talk to' the Controller, but the Controller doesn't need to know how to 'talk to' the View. Notice what I did to the Controller? Makes the API between the View and the Controller a little clearer. It does separate the ‘roles of responsibility’ a little more, doesn’t it? After all, it is the View that’s concerned with the interface. It would know best when to rebuild, no? Regardless, with this package, such things are left to the developer. Lastly, notice how I created a static String field in the MyApp class called, title. It’s named ‘MyApp’ after all—It should know its own title. 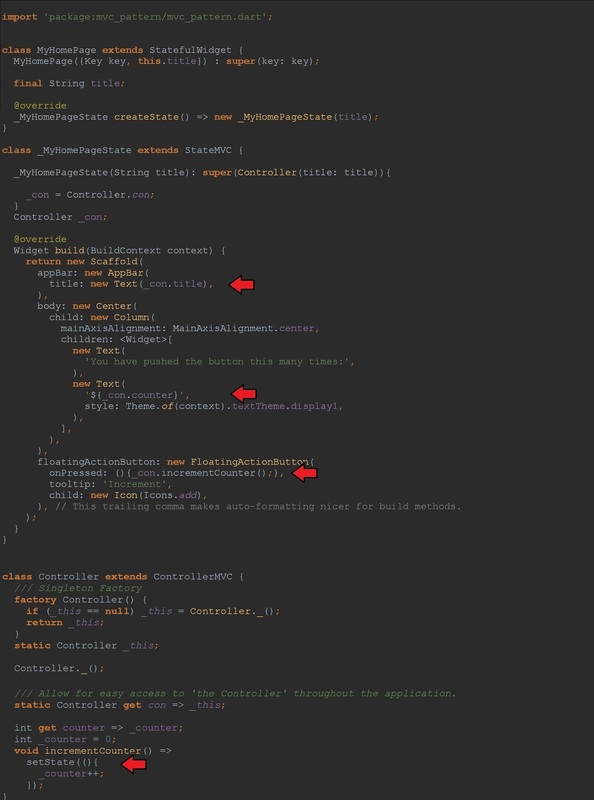 You see in the 'App' class above, that the Controller is instantiated in the parent class. 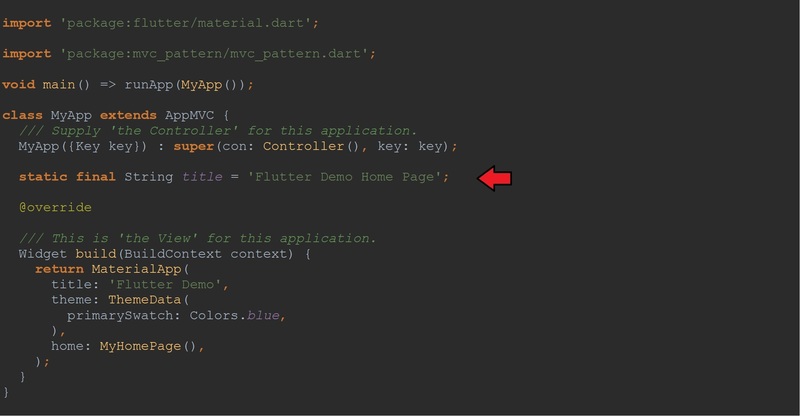 Doing so allows your Controller to now access the many 'events' fired in a typical Flutter app. Note above, it's a full screenshot of the counter app example, and there's further changes made compared to the previous examples. 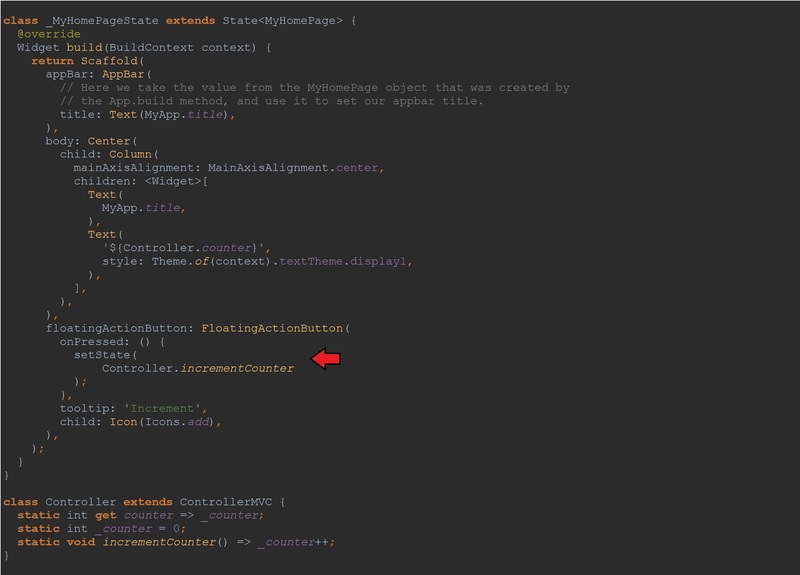 Note, the State object again extends StateMVC and the 'MyApp' class is returned to StatelessWidget. Allows the State object to address events instead. Here, the Controller is passed to its parent class to 'plug it into' the event handling of a typical Flutter Widget. 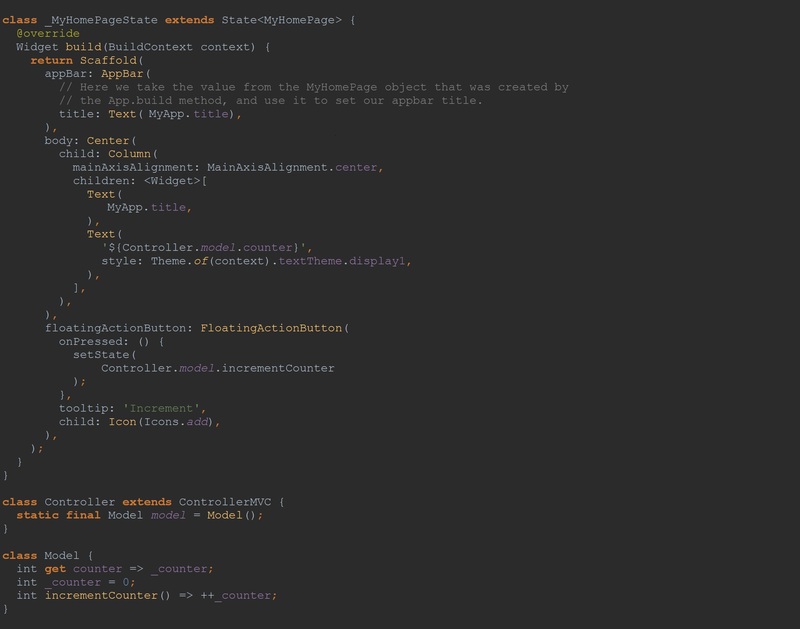 Finally, note the Controller's property and function names have been changed. This merely demonstrates that there's no 'hard cold rules' about what the API is between the View, the Controller, and the Model. You merely need to be consistent so they can 'talk to' each other. However, what if you want the View to talk to the Model? Maybe because the Model has zillions of functions, and you don’t want the Controller there merely ‘to relay’ the Model’s functions and properties over to the View. You could simply provide the Model to the View. The View can then call the Controller's properties and functions as well the Model’s. Not particularly pretty. I mean, at this point, you don't even need 'the Controller', but it merely demonstrates the possibilities. With this MVC implementation, you have options, and developers love options. Below, I've changed it a little bit. The View still has access to the Model, but the Controller is still responsible for any 'event handling' and responds to the user pressing that lone button in the app. // Fields in a Widget subclass are always marked "final". 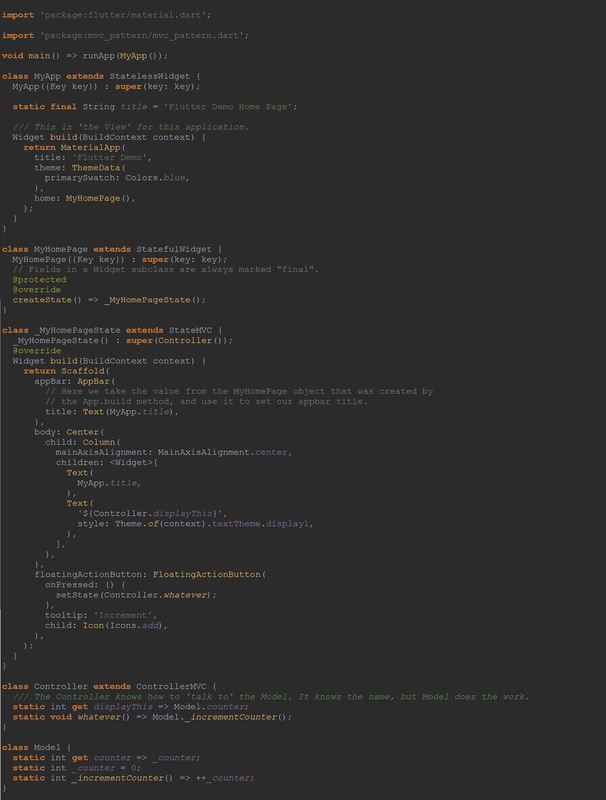 // the App.build method, and use it to set our appbar title. /// Allow for easy access to 'the Controller' throughout the application. /// The Controller knows how to 'talk to' the Model. It knows the name, but Model does the work. This is the application offered in the website, Write Your First Flutter App, when you're first learning Flutter. This version has this MVC implementation. Note the two classes below. RandomWords is extended by the StatefulWidgetMVC and the other, RandomWordsState, extended by StateMVC. With the class, RandomWords, the super constructor is passed the 'State Object', RandomWordsState (StateMVC). In turn, the State Object takes in the Controller Class, Con. // and places each suggestion into a ListTile row. // For even rows, the function adds a ListTile row for the word pairing. // to see on smaller devices. // Add a one-pixel-high divider widget before each row in theListView. // The syntax "i ~/ 2" divides i by 2 and returns an integer result. // For example: 1, 2, 3, 4, 5 becomes 0, 1, 1, 2, 2. // minus the divider widgets. Note how its all made up of static members and turns to Model for all the data. This Model works with the third-party library, english_words. The rest of the application has no idea. The Model is solely concern with where the 'words' originate from. [1.3.1] - Dec. 10, 2018. sdk: ">=2.0.0 <5.0.0"
/// Note: This license has also been called the "Simplified BSD License" and the "FreeBSD License". /// See also the 2-clause BSD License. /// this list of conditions and the following disclaimer. /// this list of conditions and the following disclaimer in the documentation and/or other materials provided with the distribution. /// THIS SOFTWARE IS PROVIDED BY THE COPYRIGHT HOLDERS AND CONTRIBUTORS "AS IS"
/// THE IMPLIED WARRANTIES OF MERCHANTABILITY AND FITNESS FOR A PARTICULAR PURPOSE ARE DISCLAIMED. /// EVEN IF ADVISED OF THE POSSIBILITY OF SUCH DAMAGE. /// Uncomment the import statement the line in the function, makeWordPairs(), below. /// Of course, that means you'll have to modify your pubspec.yaml file. /// Uncomment the import statement above and the line below to try this example. To develop apps using a framework following the MVC design pattern separating the app's 'interface' from its 'business logic' and from its 'data source' if any.